As standard reference electrodes we offer two glass electrodes in a short and a long construction with a NS7 grinding in variants of Kalomel, Ag/AgCl, Hg/HgSO4 and Hg/HgKOH. Those electrodes are equipped with a 4mm banana jack and fit into the intermediate vessel of KMZ3/5. Furthermore we have let manufactured own intermediate vessels for our cell containers for rotating electrode, which subserve as salt bridge and capillary and also are suitable for the aforementioned reference electrodes. Additionally we have used them in cells and constructions, where they were immerged immediately into the electrolyte. The ceramic diaphragm at the top of the electrolyte offers a good protection, even in direct contact with the electrolyte. If you want to measure without chloride, the use of an intermediate vessel and an Hg/HgSO4 electrode is recommendable. Besides those electrodes we offer a hydrogen electrode of the type of Hydroflex. Hydroflex is not larger than a pen, it works without an inner fluent electrolyte and it is successively applicable in many solutions. With 12 cm length it is just as big as a pen and thereby easy to handle. The shaft has a diameter of ca. 8 mm. The head of HydroFlex consists of resistant plastic (PMMA) and the shaft is made out of PTFE. You can apply the PTFE-shaft in solutions until a temperature of 210°C. The ambient temperature for the head should not exceed 50°C. HydroFlex is applicable in a lot of solutions one after the other. If the use for example in Hg/HgO-references in acid or in Ag/AgCl in lyes is forbidden, HydroFlex for example can be took out of sulphuric acid and used in another solution for example potash. It works without an inner, fluent electrolyte and without an additional electrolyte bridge. The entry of undesirable ions isn’t possible anymore. By an internal hydrogen supply, no extra hydrogen bottle is needed. The hydrogen supply works with a changeable Cartridge. For a direct insertion in battery cells we have let manufactured a special intermediate vessel with a small top. As a counter electrode we supply as standard to KMZ3//5 a vitreous body with NS 24, a platinum sheet with 24 cm² and a 4mm banana jack. 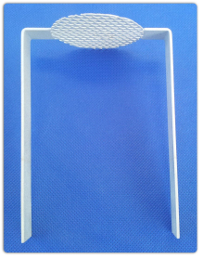 For measuring cells for our rotating electrodes we supply a round vitreous body with a 2mm banana jack and a round platinum sheet with 2cm diameter, which will be contacted with a 70mm long platinum wire. This wire gives the system a higher flexibility. With skillful bending the sheet metal can be placed at the bottom of the measuring cell under the rotating electrode. In special cases we have delivered the standard electrode with this wire extension. In special applications for example for simple cells for the measurement of cathodic disbonding we delivered counter electrodes made of platinum plated titanium in rod shape. The active length of this electrode amounts 150 mm, the diameter 6 mm, in principle those dimensions are optional. For special glass jars with an individual height we have extended this part, embedded it in plastic and assembled it with a standard grinded plug, so the part can be inserted in the lid. For rotating cylinder electrodes or rotating disc electrodes, for which a higher current is necessary, we have delivered electrodes, which you can see on the following pictures. We have already delivered intermediate vessels in different designs. The following picture shows a standard intermediate vessel for the measuring cell for our rotating electrode. The head has a NS7 for the standard reference electrode, the glass body has an outer diameter of 12 mm and the diaphragm on the top points upwards. For rotating cylinder electrodes we also have inserted it laterally, so the top can be positioned in front of the electrode. Either the intermediate vessel is inserted with a drilled ground glass joint stopper or with a pressed fitting in the lid. Thereby the intermediate vessel can be moved in height, which allows exact positioning. The following picture shows a similar intermediate vessel, but with a NS14.5 for standard lids. It also can be used in KMZ3/5 and provides a simplified opportunity to bring the reference electrodes. 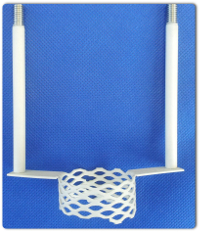 The next picture shows an intermediate vessel, which was especially made for Hydroflex reference electrode. The measurement should be performed in between the lamellae of a car battery. Via the narrow tip of this intermediate vessel the measuring point can be well positioned. The instrument is a small cylindrical container(volume ca. 20ml) that can be filled with the test solution. The sensor contains a very small Ag/AgCl reference electrode and a platinum counter electrode that allows the classical three-electrode electrochemical measurements. 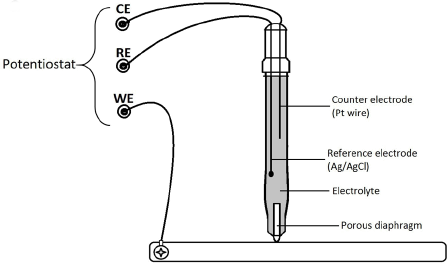 The electrolytic contact to the surface under test is established with a pen like porous diaphragm with a diameter of ca.1mm. Thus the sensor does not require any sealing to avoid leaking of the electrolyte. Besides the sensor defines the measurement area.